The Aida referenced above was recorded in Rome in June and July, 1961, with the Orchestra del Teatro dell’Opera di Roma conducted by Sir Georg Solti and featuring the “Verdi dream cast” of Price, Vickers, Robert Merrill, Rita Gorr, and Giorgio Tozzi. Produced by Richard Mohr with engineers Lewis Layton and René Boux, the RCA Living Stereo recording won the Grammy Award for Best Opera Recording in 1962. Price was at her peak during this period, in terms of both vocal prowess and international stardom, and by 1961 had been performing the role of Aida for several years. A few months prior, in January of 1961, she also made her début at the Metropolitan Opera House, where her legendary opening night performance of Verdi’s Il Trovatore received a 42 minute standing ovation. This occurred six years to the month after Marian Anderson paved the way as the first black woman to sing at the Met. In honor of Price’s 90th birthday, Decca just released a special deluxe edition of her 1961 recording of Verdi’s Aida. Though reissued numerous times over the years, many of these recordings have been criticized for poor sound quality, having been dubbed from LPs. This three disc set is newly remastered from original analog sources by former Decca engineer Paschal Byrne. Since CDs don’t support sampling rates greater than 44.1 kHz, the third disc is a Pure Audio Blu-ray featuring 96kHz/24-bit high fidelity sound. The hard-back edition includes liner notes by William Weaver, an essay on the recording by Richard Mohr, as well as the libretto and synopsis in English, German and French translations. 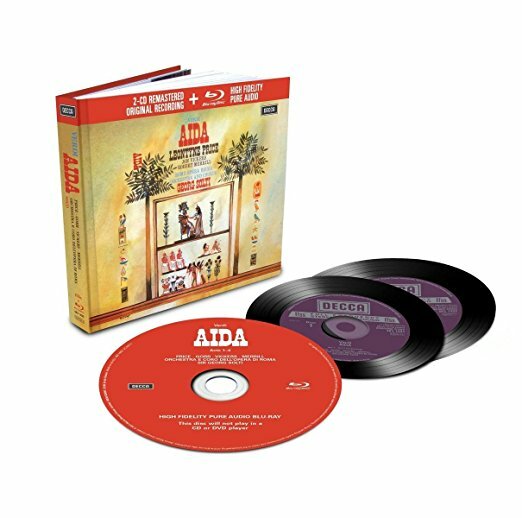 If you don’t already have one of the recent reissues of Leontyne Price’s 1961 Aida, then this deluxe edition is highly recommended if you have a Blu-ray player.